The Arctic waters are divided into sectors of responsibility belonging to five countries — Russia, the U.S., Norway, Denmark and Canada — but the borders delineating national waters have still not been fully defined. The Arctic remains an area with low conflict potential, despite territorial disagreements and the current tension between Russia and the West. But to preserve this state of affairs, the international community must make serious efforts to work together. "The Arctic is one of those few areas in which international cooperation with Russia has not only not been reduced, but has actually increased," said Dmitri Rogozin, Chairman of the State Committee for Arctic Development, on Oct. 13 at a conference entitled "International Cooperation in the Arctic: New Challenges and Vectors of Development" organized by the Russian International Affairs Council. This continued cooperation is indicative of the importance of the Arctic, one of the world’s most unique ecosystems and one of the its richest in terms of natural resources. Scientists believe that the Arctic contains 13 percent of the world's unproven oil reserves, 30 percent of the world's natural gas and about 10 percent of the world's fish resources. The region is also becoming more accessible as polar ice melts, making dialogue between circumpolar countries ever more important. The Arctic waters are divided into sectors of responsibility belonging to five countries — Russia, the U.S., Norway, Denmark and Canada — but the borders delineating national waters have still not been fully defined. Ownership of the sea areas is established according to the continental shelf and is often difficult to determine. As a result, disputes persist. In 2015, Russia filed an application with the UN to expand its Arctic territory by 1.2 million square kilometers. Russia's request crosses over onto Canada and Denmark's territorial claims. For now the request is being reviewed (Canada's response will be filed only in 2018) and the fate of the contested territories is unclear. "When we were preparing the application we already knew that it would intersect the interests of other countries, which is why the preparation was very serious. We are ready to prove scientifically that our country must expand as a result of the Arctic shelf. It is important that politics do not interfere in this argument," said Arthur Chilingarov, Russia’s Special Presidential Representative for International Cooperation in the Arctic and Antarctica. 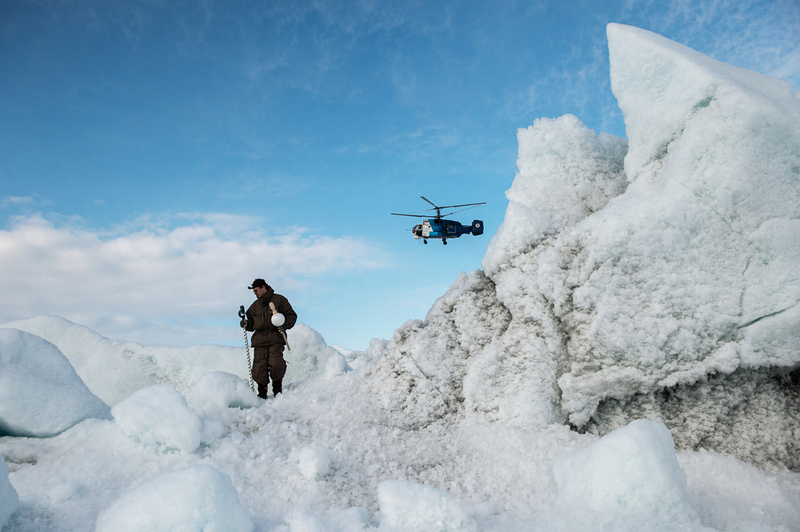 Due to the Arctic's resources and unresolved territorial issues, the region has the potential to be an area for conflict — even military conflict — between Russia and NATO. In April, Roger Boyes, a journalist for British newspaper The Times, accused Russia of militarizing the region and planning for a new Cold War there. Russia does indeed have a military presence in the region, but Russian experts say characterizing it as “militarization” is inaccurate. In 2014, a separate military district was formed at the Northern Fleet base in the Arctic Circle. Military airports in the region are being renovated, and additional navy ships and submarines suited to the Arctic climate are under construction. However, Igor Petrenko, professor at the Russian Armed Forces General Staff Academy, says that all of Russia’s moves are legal and done with the aim of guaranteeing its own security. "Today Russia does not have the concentration of armed forces in the Arctic that the USSR had," Petrenko said. He emphasized that nowhere in the Arctic does Russia have an advantage over NATO countries — that Russia has enough armed forces for defense but not for an offensive move — and that it is only trying to maintain the status quo. The other Arctic countries adhere to the same position. Dmitri Tulupov, assistant professor in the faculty of the theory and history of international relations at St. Petersburg State University says "the militarization of the Arctic" and "the battle for the Arctic" are just clichés spread by the media. A military confrontation in the Arctic would be expensive, economically risky and it would pose an ecological threat to the whole region. "There exists an orderly mechanism for regulating disputes, including those concerning resources," Tulupov said. "It is very difficult to imagine that anyone would fight in the Arctic over its resources." According to Igor Petrenko, it would be practically impossible for Russia and the West to engage in a proxy war in the Arctic. "There is no sacrificial pawn in the Arctic. There the conflict can only be direct, and no one wants it," Petrenko said. Nevertheless, Georgy Ivanov, member of The Arctic and Antarctica Council at the Russian Federation Council, noted that there is always a risk of unplanned incidents, especially with the current tension between Russia and the West, which makes it impossible to fully exclude the possibility of a war for the Arctic. Traditionally the Arctic has been in the sphere of interest of the members of the Arctic Council: Russia, Denmark, Norway, Iceland, Canada, the U.S., Sweden and Finland. But in 2013, the Arctic Council expanded to include 12 observer countries, including China, India, Japan and South Korea. Experts say that this trend reflects the interest of non-Arctic countries in the region. "Of course, in this area Arctic countries play a central role," said Ding Huang, dean of the School of Politics and Public Administration at Wuhan University in China. "But in my opinion, not only [these countries] should participate in Arctic affairs." Ding pointed out that other nations have a vested interest in the Arctic within the context of the Northern Sea Route, which will become a more viable shipping route from Asia to Europe as the polar ice cap continues to melt. That is one reason why China is interested in playing a big role in the Arctic Council and cooperating in a bilateral manner with circumpolar countries, including Russia. The Northern Sea Route (NSR) is attractive not only for China, but also for Japan and Asian countries in general, said Dmitri Streltsov, dean of the Middle East studies faculty at the Moscow State Institute of International Relations (MGIMO). "For example, for Japan, the route to Europe along the NSR is 12 days shorter than the South Ocean Route and it crosses safe regions," Streltsov said. According to the Russian Ministry of Transportation, the flow of cargo along the NSR could increase from 4-5 million tons in 2015 to 65 million tons in 2020. However, the underdeveloped ports in Russia's Arctic and the harsh climate are still impediments to full use of the route. Additionally, the route is not completely free year round. Scientists think that the NSR will be fully accessible to shipping no sooner than 50 years from now. Yet, the internationalization of the region is inevitable, says Vladimir Petrovsky, chief scientific researcher at the Institute of Far East Studies of the Russian Academy of Sciences. "The Arctic is gradually turning into what in English is called a global utility, like space or the Internet. It is becoming a sphere of global management, where the most diverse interests meet," Petrovsky said, adding that the arrival of new players in the region is nothing to fear as the efforts of all of humanity are needed for the Arctic to develop in a healthy way. This text is based on material presented at the conference "International Cooperation in the Arctic: New Challenges and Vectors of Development" organized by the Russian International Affairs Council and dedicated to the 20th anniversary of the Arctic Council.